Over the past five years, Google and Facebook have consistently been able to organically grow their revenues greater than 20% a year. In the case of Google, in the past two years they have added over $20 billion in revenue a year. That is an impressive feat. Other companies, that are significant players in their markets, like Oracle and IBM, have struggled to post organic revenue growth of more than 5%. When you look at companies that are admittedly second or third tier players in their markets, like American Software, Amdocs, or PegaSystems, the trend becomes more acute. This table shows a typical analysis of a late stage licensed software product line. Even though license revenue is growing, it cannot overcome the declining maintenance revenue due to annual maintenance attrition. It is fairly straightforward to calculate this and prior to the SaaS era most public companies reported license revenue and maintenance revenue separately. Growth in existing customers billing is offsetting a significant portion of the revenue attrition. Product managers need to understand these trends and drivers in order to have a foundation to build their revenue growth strategies on. We will explore each of these strategies and tactics below. The categories are types of revenue. Net New is sales to net new customers, Add-On is sale of additional products to a customer that has already purchased a base product, Expand is the sale of more seats/units of a product a customer has already bought (like adding another division or department), Migration is a paid migration from one version of a product to another version, and Financial are deals that are primarily driven by financial conditions, such as disaster recovery/test licenses, usage audits, or sit licenses. The spokes are specific events that occur in the marketplace that lead customers to initiate their buyer journey. For example, this is a Money Wheel for a marketing automation provider. The two biggest events that initiate net new sales are 1) the arrival of a new VP Marketing (research showed the 75% of new VPs initiate a technology purchase of more than $100,000 in the first six months) and 2) the company posts a bad quarter of revenue results that in turn drives the need to fundamentally improve marketing demand generation. To learn more about Money Wheel Analysis check out: Moneywheel – A Revenue Sourcing Analysis Technique for Product Managers. To learn more about identifying events that trigger the start of buyer journeys check out Product Managers: Change the Top of the Sales Funnel: Trigger Driven Prospecting. Win-Loss is a qualitative market feedback practice designed to help you see your business from the outside in. As the name implies, Win-Loss speaks directly to the buying process of your customers. Understanding why you win or lose business is critical to improving your odds next time. Win-Loss Research – Usually phone interviews with buyers using open-ended questions. Win-Loss Analysis – Parsing of the information pulled from the phone interviews to find themes and patterns. Win-Loss Reporting and Feedback – The results are presented and used to better know your markets, improve processes or products. Win-Loss is a unique opportunity to hear directly from your buyers. Why do they buy? How are their decisions made? Win-Loss is your chance to get those answers. We recommend asking targeted buying-process questions like these. What business or team problem was your buyer trying to solve when they decided to find a solution? How did your buyer go about selecting a vendor? What media or thought leaders did your buyer consult before they made a decision? Could you have done something differently that would have given you a better chance of winning the business? Does your buyer feel that they got the value they expected from their purchase? How did your marketing efforts impact the decision? Does your team have the right messages and content? You can see how knowing the answers to questions like these will help inform your product and processes. To learn more about Win/Loss Analysis download the Win/Loss Primer here. In the spirit of full disclosure I am a board advisor to the Win-Loss Agency. Another revenue growth strategy is to develop and launch add-on products/services. While revenue optimization strategies offer the lowest risk of execution, their upside revenue potential is limited. Add-on products represent a slightly higher execution risk, but materially larger revenue potential. Add-on products target your existing customers who have already seen the value of your offerings and willingly paid money for them. Access to a captive base of receptive customers is one of the most appealing aspects of the add-on product strategy. To be effective, however, add-on products have to offer new, distinctive, and recognizable value for customers. It cannot simply be a rebranding and repackaging of existing capabilities for a new price. Customers legitimately expect that a vendor will evolve their base offering as a part of the deal for either maintenance revenues or monthly subscription fees. Leveraging major current technology trends is one way to drive innovation and add-on product ideation. In today’s market Big Data, Artificial Intelligence, and Machine Learning are major new technologies that are driving change. If you were a supply chain management solution provider, here is an example of how you could leverage these trends to build a new add-on product. Your base product provides analytics that produce supplier performance scorecards. Users express a need that your current solution does not address. A user wants the system to make a recommendation based on past supplier performance for a difficult choice. The buyer has a choice between two suppliers to fill a given order. Supplier A has superior on-time delivery performance, but at a higher shipping cost than Supplier B. Supplier B’s shipping costs are significantly lower, but delivery can be one to two weeks after the desired delivery date. Which supplier should the buyer choose? An AI-enabled agent could determine the relative gross profit difference between Supplier A having the product available for sale sooner than Supplier B. It could also factor in the anticipated weather and the impact weather could have on delivery performance based on past history. The system could estimate the probability of bad weather, its potential impact on Supplier A and Supplier B’s delivery performance, consider the impact of lower gross margins due to Supplier A’s costs, and then recommend the best choice for the buyer. This capability would be a significant value add for the customer. There are several open source Big Data and Open Source platforms that could be leveraged to accelerate the development and deployment of such an add-on product. Products like Apache Hadoop for Big Data and Google’s Tensor Flow for machine learning are just two examples. Your firm would not have to invest in building Big Data or Machine Learning infrastructure platforms, they could focus on answering the key questions your users have. 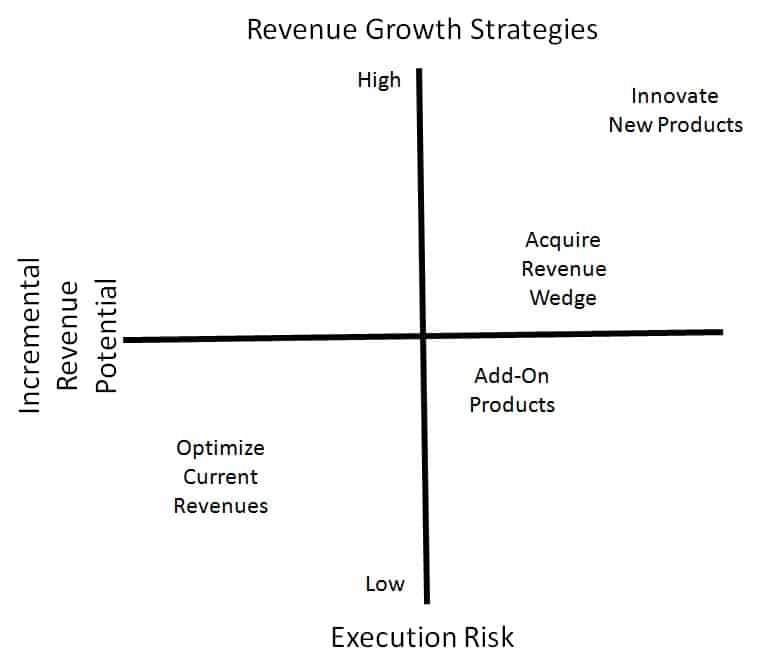 A proven strategy for increasing revenues is the inorganic revenue or wedge acquisition. Under this approach a company acquires another company primarily for the revenue it can add to the combined entity and increased profits. Profitability can be increased through the consolidation of business operations which results in lower total expenses and the cross-selling of products into the assembled customer bases. Typical wedge acquisitions involve the acquisition of smaller competitors or distressed organizations. Companies like Computer Associates, Sterling Software, Platinum Technologies, Infor, and even Oracle have used this strategy to sustain total revenue growth over long periods of time. Wedge acquisitions do not solve organic revenue growth problems, they merely postpone them. Most wedge acquisitions are of companies that have their own organic revenue growth problems. While the acquisition may solve a short term revenue growth problem it does not address the core issue. Consider the following chart. Using wedge acquisitions are a core strategy works as long as there are companies that can be acquired at acceptable prices. Eventually all of the reasonably priced firms are acquired and the acquirer is left with an even bigger organic revenue growth problem. The fourth strategy for sustaining organic revenue growth is the most risky and yet the most rewarding: Innovating New Products. According to a study, companies that adopt a market-driven approach to innovation delivered shareholder returns of 150 percent while the S&P 500 has delivered 14 percent. Most people think that innovation is like winning the lottery – brilliant people like Steve Jobs just know that the market needs an innovation like the iPod or iTunes. Successful companies know that innovation is a discipline, not an accident. A key aspect of this discipline is developing superior market-sensing skills and peripheral vision. There are three techniques that are helpful to build this capability in your organization. A foundation of market-sensing and peripheral vision skills is listening to all types of voices in your organization that can provide insight into market needs. For example, drug maker Organon was developing a new antihistamine. Unfortunately the clinical trials did not go well. A secretary who helped administer the trial noticed that some of the participants were particularly cheerful. An executive noticed her feedback and they pivoted the research into an antidepressant that became known as Tolvon. Viagra was originally developed to treat high blood and angina before the benefits of its current usage were discovered. Scenario based thinking was pioneered by Royal Dutch Shell in the 1960s and is another tactic for developing innovations. It is just as valuable today as it was then. Scenario based strategy looks at combinations and permutations of social, economic, technological, or political changes into possible scenarios. While some scenarios are plausible many are unlikely. By examining a set of scenarios organizations can discover unexpected, but important situations that they need to deal with. Natural gas powered power plants that do not contribute to greenhouse gases? That is unthinkable. Scenario based planning is one tool organizations should have in their portfolio to help examine edge case scenarios that might spark innovation ideas. Another tactic steals from what General Electric did during the DotCom boom. As the dotcom market heated up, General Electric started a company-wide initiative known as destroyyourownbusiness.com. Basically managers were tasked with imagining how a competitor or startup could destroy their business. This is basically another technique managers can use to spur out-of-the-box thinking. By considering how a competitor might exploit the inherent weaknesses in their business, organizations can begin to identify ways to mitigate what be structural problems in their business. For smaller players in a market, envisaging how they might disrupt the market leaders can also lead to innovation ideas that previously might not have been considered.